Professor McMinn is interviewed by Orthopaedic Research UK and talks about his career and the future of hip resurfacing. Best wishes to Sir Andy Murray on his successful hip resurfacing surgery. Everyone at the McMinn Centre wishes him well and that his BHR will enable him to carry on playing tennis as well as leading a painfree life. Derek McMinn and Ronan Treacy give Orthopaedic Product News an update on the hip replacement and hip resurfacing market. In this video we talk to some of the early patients about their experiences with the new implant and their care at the McMinn Centre. Our thanks to the patients who kindly consented to being interviewed. Mr McMinn introduces the latest developments in hip resurfacing including an update on the progress of his work on X-Linked poly on metal resurfacing. In response to the recent Telegraph article, Mr McMinn would like to reassure all of his patients that nothing has changed in the outcomes of our hip resurfacing and total hip replacement patients. Our results do not show anything different, but the MHRA guidelines have changed, probably because of some reports of small diameter metal-on-metal total hip replacements. We have not had an increase in our failure rates due to metal reactions. A small percentage of hips had to be revised to non-metal-on-metal total hip replacements, but the percentage of patients needing revision for all wear-related problems and metal-reactions is less than 1% in men, and less than 3% in women at 19 years. We have investigated the earliest series of our BHRs, with extensive assessments including CT scanning at post 10-year reviews, and found no cause for concern with hidden problems in asymptomatic patients. Birmingham Nuffield Hospital/ BMI Edgbaston Hospital/ Spire Little Aston Hospital will be in touch with you depending on when/where you had your operation, informing you of the MHRA guideline reviews. Celebrating Twenty Years of the Birmingham Hip Resurfacing (BHR)! 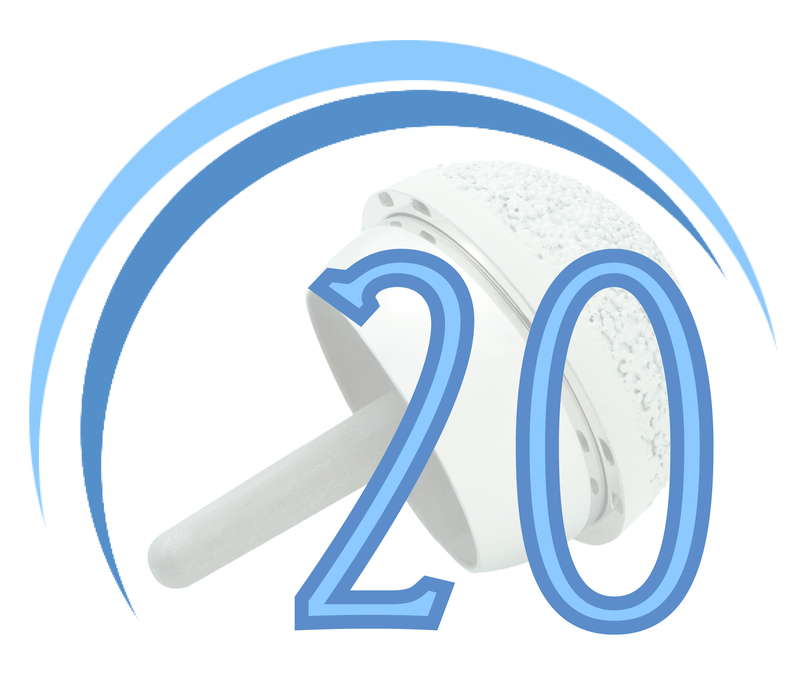 This year marks the 20th year of the Birmingham Hip Resurfacing (BHR)! Mr McMinn implanted the first ever BHR on 30th July 1997 and has since performed over 3800 BHRs in patients from all over the world. Mr McMinn would like to hear from you to mark the 20th Anniversary of the BHR. We are making a celebratory video for the occasion and in order to do this we’d love to include the stories behind making the BHR a success – your stories! What we are looking for are video clips from patients saying how long you have had the BHR and how you have resumed your active life following your BHR. As well as this, video clips of you partaking in an activity you love or just general exercise showing off your BHR over the years would also be great! We've created a poster that you can print out and hold up in your videos too! Our aim is to get as many video clips of our BHR patients as possible in order to mark this special anniversary in orthopaedic history. We're looking for a variety of stories however big or small you may think; being able to walk to the shops, driving long distances, walking the dog, getting back to work, partaking in a competition, climbing a mountain, the list is endless! Please note that our email inbox can only accept files less than 10MB so we highly advise that you upload your videos to one of the following file-sharing websites: Google Drive or DropBox both of which can be joined for free. Once uploaded, please email a download link to your file(s) to robknowles@mcminncentre.co.uk with the subject: '20 Years of BHR'. We can accept most major video formats (AVI, MOV, MPG, WMV, MP4) and mobile phone footage as well. If you need any assistance with video formats or uploading, please let us know. This #InaugurationDay , Mr McMinn says ‘Make Resurfacing Great Again’, pictured here with Joseph Daniel (McMinn Centre Director of Research) and Terry Smith (Managing Director of Jointmedica). Mr McMinn’s latest invention, the Metal-on-Polyethylene PolyMotion® Hip Resurfacing device is now available on a custom basis, click here for more information. The PHR is an ideal solution for metal allergy sufferers who want to reap the same rewards as a standard Hip Resurfacing. For further information, please watch Mr McMinn’s latest video lecture available here. Last March, superstar boxer Anthony Mundine flew all the way from Australia to the United Kingdom to sort out his hip troubles. Anthony had been suffering from hip problems for several years and chose to travel to the UK for BHR surgery with Mr McMinn because, in Mundine's words, "To get the best outcome you’ve got to go to the best surgeon and Mr McMinn is one of if not the best surgeon in the world." Immediately following his surgery, Mundine spoke of his ambition to return to the boxing ring for a showdown with his old rival Danny Green, dubbed ‘The greatest rivalry in Australian Sport’. This ambition is now going to be realised in Adelaide on February 3rd 2017 as the two enemies go face to face in the ring once more. Click here to watch Anthony’s McMinn Centre Interview from last year. The event will be available to watch in Australia via Online Pay Per View services, click here for more information. From everyone at The McMinn Centre, we’d like to wish Anthony all the very best for the fight and we will be cheering on from across the pond! The Birmingham Post have been compiling a list of the "most influential people" in the West Midlands. 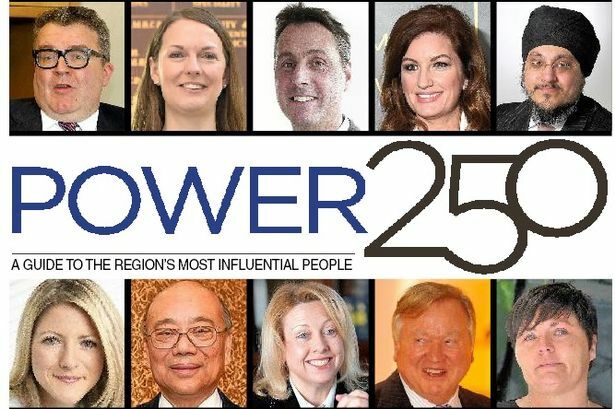 The "Power 250 identifies the senior figures in 25 sectors that are key to the future of the city". The Post have selected ten figureheads representing these 25 sectors and their contributions towards the city of Birmingham and the surrounding areas. We are pleased to say that Mr McMinn has been named in the top ten of the 'Science' sector for his pioneering invention - The Birmingham Hip Resurfacing (BHR). The McMinn Centre is delighted to see Mr McMinn receive this recognition for his determined hard work over the years. To see the full list including Mr McMinn, click here and then click on the link labelled 'Science' on the article. Online petition nears 1000 signatures... and counting! The McMinn Centre's online petition to Smith & Nephew for the 'Reversal of [their] decision to withdraw Birmingham Hip Resurfacing implants for women' has almost passed the one thousand signatures mark as of today, a number we hope will continue to rise! If you have already signed the petition, we'd like to extend a big thank you for your support from Mr McMinn and his team, as well as the wider Hip Resurfacing community. Please continue to spread the message and share the link where you can in order to continue the momentum of support and make our voices heard. 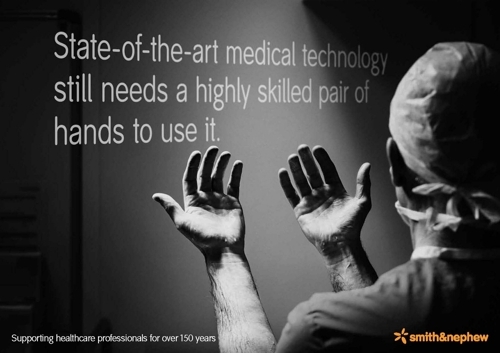 We think that Smith & Nephew should believe their own adverts. The Birmingham Hip Resurfacing (BHR) results in women are excellent in a highly skilled pair of hands. The BHR results in women are not good in inexperienced hands. So what's the solution to this? Only allow experienced surgeons with proven good results in women to use the device, or withdraw the implant and deny women highly effective treatment? The solution is simple. Today marks the eighteenth year of the Birmingham Hip Resurfacing (BHR) in clinical use! On 30th July 1997, Mr McMinn implanted the first Birmingham Hip Resurfacing (BHR) and the bone conserving prosthesis has continued to produce excellent results for both men and women – in experienced hands. Mr McMinn’s fifteen year results showed that results for women with osteoarthritis (OA) treated with a BHR are as good as the results of men with OA treated with BHR. Watch this space for our eighteen year BHR survivorship results which will be available soon. However this milestone is not such a ‘happy’ birthday. On June 4th 2015, Smith & Nephew – the manufacturer of the BHR – released a statement announcing a ‘voluntary recall’ of the smaller sizes of the BHR predominately used in women, citing data from the National Joint Register (NJR) which reflected the total results from experienced surgeons, inexperienced surgeons and trainee surgeons. The latter two groups have significantly lowered the average results, enabling Smith & Nephew to use this as a representation for all small size BHRs. This ‘voluntary removal’ was undertaken without consulting any experienced and higher-use surgeons, ignoring the results of experienced surgeons like Mr McMinn. A team of 10 colleagues and friends from Birmingham are hitting the streets this summer to raise money for cancer care charity, Dimbleby Cancer Care. 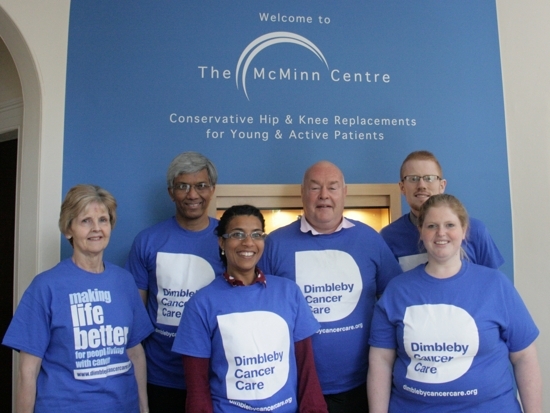 The group from the McMinn Centre, a pioneering hip resurfacing and knee replacement centre, will be joining broadcaster Jonathan Dimbleby and a host of walkers on Friday 5th June to take part in Dimbleby Cancer Care’s 50/50/50 event - a 50km walk through London during the night that aims to raise £50,000. Dimbleby Cancer Care was set up in 1966 in memory of broadcaster Richard Dimbleby and is based at Guy’s and St Thomas’ hospitals in London. It gives practical and psychological support to people living with cancer and to their families and carers. Derek McMinn, 61, Consultant Orthopaedic Surgeon and founder of the McMinn Centre said: “I first met Jonathan when I resurfaced one of his hips 11 years ago and the next one five years later so when he invited me and my team to take part in this exciting challenge I couldn’t say no. I not only wanted to raise money for such a great cause but also wanted to see his new hips in action and see how they would stand up to such an endurance challenge. Joining Derek on the McMinn Centre team is Joseph Daniel, Hena Ziaee, Pam Charles, Emma Carr, Rob Knowles, Wayne Carr, Peter Allen, Philippa Gilmour and Chris Knowles. The team are all from the West Midlands area except Peter, another of Mr McMinn’s patients with two resurfaced hips, who is visiting the UK from Singapore! The event is an endurance challenge in support of the charity founded in honour of Jonathan’s father, Richard, who died 50 years ago this year. Starting in the evening, the walk’s route takes in famous London landmarks including Trafalgar Square, Buckingham Palace, the British Museum, the Tower of London, Canary Wharf and Greenwich. The event, which is sponsored by Leon, starts at St Thomas’ hospital and finishes at Guy’s hospital, the two hospitals where the charity provides its services. All the money raised will go towards the charity’s ‘Care for the Future’ appeal, which aims to raise £500,000 by the end of 2016 so that it can continue and expand its work within the cancer community. Press Release supplied by BluebirdPR. Badminton Masters Champion Sian Williams has given us an update on her sporting progress since her interview with us in 2014. Sian underwent Birmingham Hip Resurfacing (BHR) surgery with Mr McMinn in 2009 and last year spoke to us about winning the Doubles Gold medal at the 2013 Badminton World Masters Championships in Turkey. Ever active and always looking forward to her next challenge, Sian is fresh off the back of yet more medal wins at major Masters Championships. 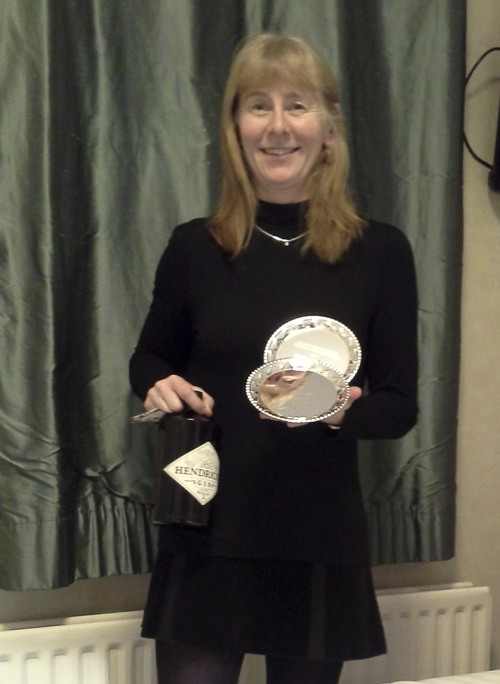 In September 2014, Sian competed in the Women’s 50+ Singles tournament at the European Senior Badminton Championships in Caldas da Rainha, Portugal. After receiving a bye in the first round, Sian saw off English opposition in Linda Wood in the second round, with a score of 21-17, 21-17. 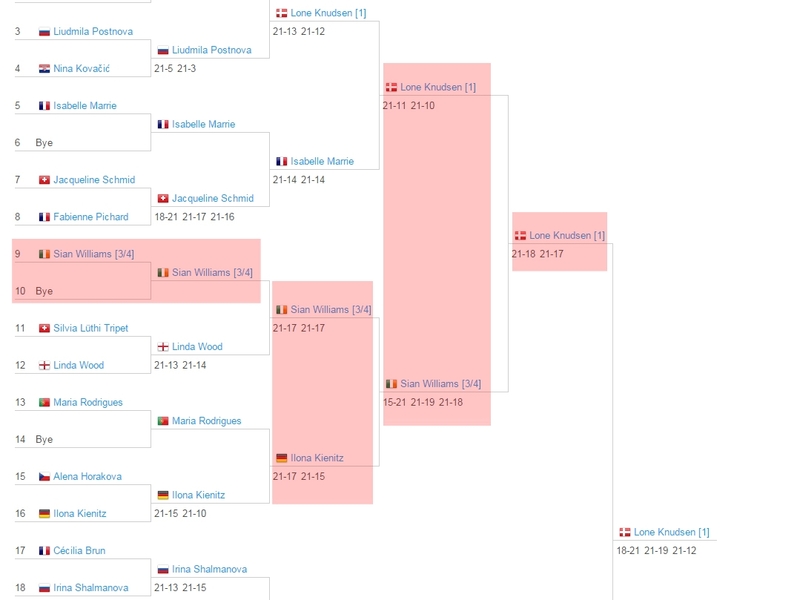 In the third round, Sian faced a tricky tie against Ilona Kienitz from Germany. Losing the first game 15-21, Sian fought back to win the second and third games 21-19 and 21-18 respectively. This saw Sian go head to head with Lone Knudsen of Denmark. It was a close match which saw Sian narrowly lose 21-18, 21-17 and Knudsen go on to win gold in the final. 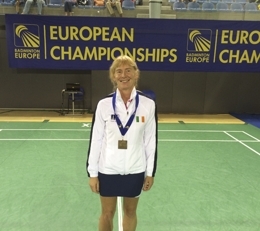 Having been used to playing in Doubles matches, a bronze medal is a fantastic achievement for Sian at European Masters level. January saw Sian enter another tournament, the 2015 Yonex Scottish International Seniors Championships held in Largs, Scotland. Competing in two events in both a Singles and Doubles capacity, Sian picked up two more medals to add to her impressive collection. In the Women’s 50+ Singles event, Sian played Gitte Hojlund and racked up a comprehensive victory of 21-12, 21-5 to claim the Gold medal. With Doubles partner Kay Vickers, Sian played in four matches in the Women’s 50+ Doubles event. It was another convincing performance, with Sian and Kay dominating and winning all four matches adding another gold medal to Sian's impressive collection. Sian really is a fantastic example of how Birmingham Hip Resurfacing (BHR) surgery with Mr McMinn can enable patients to return to the activities they love and we would like to congratulate Sian on her impressive achievements and wish her the best of luck in all future competitions! A thank you message from a 'delighted' patient! "Dear Mr McMinn, Mr Daniel, Senior Nurse Shinton, Sue Day (Physio), Sister Carol, HCA Delia, RMO Nasco, Hena, Pam, Meryl, and all the BMI Edgbaston Ward day and night nursing staff who looked after me during my right BHR last week, I cannot praise highly enough the entire team around Mr McMinn and Mr Daniel. From everyone at the McMinn Centre, we'd like to thank Gareth for his message and wish him all the very best. Happy New Year and Hippy Fifteenth Anniversary from Hans Rader! “I shall be celebrating my BHRs 15th birthday on Monday on the tennis court, thinking of Mr McMinn & his team in gratitude, having played some 100 games of tennis every week since April 2000. That’s a total of about 75,000 games since the operation – without ever suffering the slightest twinge of pain! We’d like to thank Hans for his message and send our congratulations for reaching this milestone whilst continuing to live an active and pain free life. 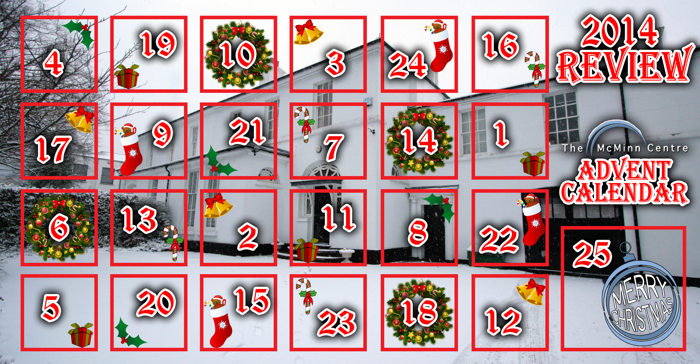 The McMinn Centre 2014 Review Advent calendar is about open its first window! Across our social media feeds, we are taking a look back at the year that was 2014. Every day in December up to Christmas we will be opening a door on our advernt calendar to reveal a look back at something that happened this past year. 2014 has been another year packed full of lectures and talks, publications and papers, clinical milestones, patient correspondence and much more! So make sure to like and follow our social media feeds above to join in with our 2014 review and countdown to Christmas! The Birmingham Hip Resurfacing (BHR) is celebrating being in clinical use for 17 years today. Since then the BHR has been implanted over 150,000 times and is widely recognised as the most successful hip resurfacing device. Having implanted two more in theatre yesterday Mr McMinn has implanted in excess of 3600 BHR’s and changed the lives of many, enabling them to get back to pain-free, active lifestyles. Mark Edwards was just 38 years old when he received the world’s first BHR on July 30, 1997. Two years ago we caught up with Mark and his progress 15 years after his surgery, click here to watch Mark’s BHR interview. 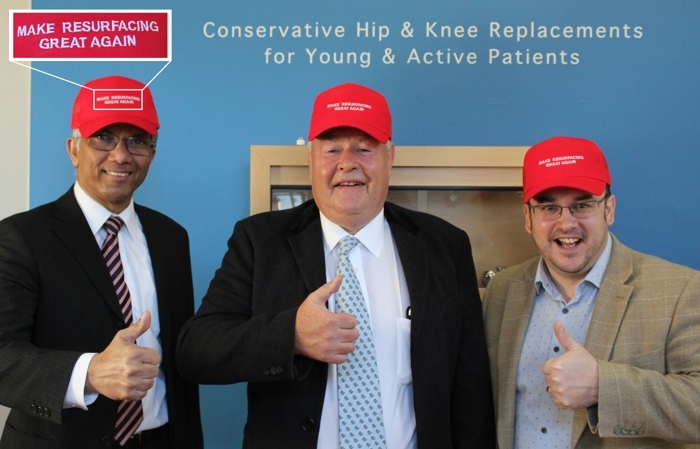 The Birmingham Hip Resurfacing was introduced by Mr McMinn as a solution to painful, arthritic hips suffered in people deemed too young for a traditional Total Hip Replacement. The bone-conserving design retains the majority of the bone with only a few millimetres from each articulating surface being removed. This allows for better anatomical matching, stability and range of movement, the BHR’s design has remained unchanged since its first implantation. Half a million views and counting! The McMinn Centre's YouTube channel has amassed an impressive 500,000 video views, almost six years to the day since its creation in February 2008. The channel contains a wide range of videos including patient interviews, web lectures and surgery footage. The best way to keep up to date with all of our video content is to subscribe to our channel. New publication confirms lower mortality rate with hip resurfacing. A new publication by an independent group has confirmed what an earlier paper from The McMinn Centre said. The paper published by the BMJ, confirms that mortality rates are lower with hip resurfacing than when compared to uncemented and cemented Total Hip Replacement (THR). As you may know, in June 2012, we published a paper showing that BHR had a lower mortality risk compared to THR. As we acknowledged at the time, our study was constrained by a limited number of confounding variables being available, click here to read our paper. On 27th November an orthopaedic group in Oxford published their paper, again in the British Medical Journal and with much more detailed confounding variables available, showing exactly the same conclusion. Click here to read the paper from Oxford. Another recent publication shows better function with hip resurfacing compared to THR, click here to read the function paper. Our fifteen year analysis shows that Birmingham Hip Resurfacing has a low failure rate, watch our lecture here. The conclusion of all these analyses is that Birmingham Hip Resurfacing (BHR) has a low failure rate, has better function than Total Hip Replacement (THR) and has the lowest death rate of any hip arthroplasty operation available. BHR Sian strikes gold at Badminton World Masters. Irish Badminton player Sian Williams underwent right Birmingham Hip Resurfacing (BHR) surgery performed by Mr McMinn in 2009. Since the operation, Sian has returned to full fitness, competing in a number of international tournaments. This month, the 2013 World Masters Badminton Championships were held in Ankara, Turkey, in which Sian and her doubles partner Pam Peard went head-to-head with professionals from around the world. The dynamic duo saw off the number two and three seeds on the way to booking their place in the final against number one seeds Lone Hagelskjaer Knudson of Denmark and Mei-Ying Lee of Chinese Taipei. In a close fought match, Sian and Pam battled to victory and won the Gold – becoming World Masters Badminton Doubles Champions. Watch Sian talk about her BHR experience and winning gold! Final Score in the Women's Doubles 50: Pamela Peard/Sian Williams (IRE) beat Lone Hagelskjaer Knudsen/Mei-Ying Lee (DEN/TPE) 22-20 16-21 21-19. Click here to see Sian and Pam's tournament progression. Well done Sian on your impressive achievement! Drive Aid – Stephen Kimbell is going the extra mile to help make a difference. This month Stephen Kimbell, a friend of Mr McMinn, is embarking on another lengthy journey to Romania in order to deliver vital supplies to orphanages and those in need. Mr McMinn feels strongly about the cause and, having sponsored Stephen in the past, he has sponsored him again for his 2013 trip. Stephen is the director of Greenspire, a corporate finance and strategic advisory service based near Milton Keynes. 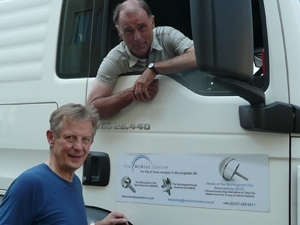 He has been supporting a range of Romanian children’s charities for a number of years by undertaking trips to deliver lorry loads of donated aid to orphanages in the east of the country. Romania suffered economic meltdown until the end of the Ceausescu regime in 1990. Over the last few years, this position had been improving and membership of the EU had certainly helped. However, the economic crash has set development back significantly and, as always, it is the most vulnerable who suffer most in such circumstances. “While it is always hard work, it is always very rewarding. The orphanages are infinitely better places and I am always delighted when I see adults with families whom I remember seeing as orphan children with nothing at all.” says Stephen, who has been making the trips for over 20 years. The journey will take twelve days and require 1,500 litres of diesel to complete. The lorry will be full of much needed food, clothes and medical supplies which will be delivered to several orphanages in Romania. There are around twenty sponsors contributing to the charity fund and Mr McMinn is more than happy to be sponsoring such a worthwhile cause. See the October 2013 Greenspire newsletter here. Mr McMinn has recorded a brand new lecture and wanted his patients to be the first to know about it. The lecture titled 'BHR and Other Options' has been released as a tribute to the late Vicky Marlow. 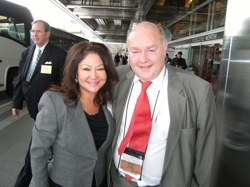 Vicky was a fantastic voice and advocate for support of Hip Resurfacing. Using her website and forum Vicky worked tirelessy to inform 100s of patients about the benefits of Hip Resurfacing. The recent lecture looks at the results of Mr McMinns first 1000 Birmingham Hip Resurfacing (BHR) patients at 12-15 Years and talks about his experiences within that cohort, also comparing the group with the results of joint registries around the world. The lecture is full with the latest results, information and ideas from the hip resurfacing and hip replacement world and really is a must watch for all patients and former patients. Watch the BHR & Other Options lecture here. Ten Years of The McMinn Centre! Today marks the tenth anniversary of The McMinn Centre, established in 2003, the centre provides a permanent base for Mr McMinn’s surgical, teaching and research work, and is the first point of contact for patients looking for conservative joint replacement. Based in the Birmingham's Edgbaston Medical Quarter, our dedicated team work together to provide an unrivalled and personal service to hip and knee replacement patients from around the world. Derek McMinn is the pioneering surgeon behind the Birmingham Hip Resurfacing (BHR) and several other orthopaedic implants, such as the Birmingham Mid Head Resection (BMHR) and the Birmingham Knee Replacement (BKR). Operating locally from BMI The Edgbaston Hospital, Mr McMinn has operated on more than 2500 patients in the last 10 years alone, whilst holding countless consultations and follow up appointments. Read more about the anniversary and The McMinn Centre here. Ian's 1200 mile End 2 End Walk! 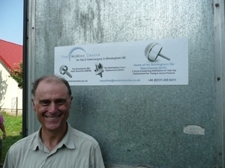 Yesterday The McMinn Centre Media Department met up with bilateral Birmingham Hip Resurfacing (BHR) patient Ian Cheal. Ian is currently a third of his way through a 1200 mile End 2 End walk. Setting off from Land's End at the start of April, we caught up with him near Ironbridge, Shropshire, though he won't reach John O'Groats and finish the walk until the end of June! Ian is doing brilliantly and is thoroughly enjoying the walk. 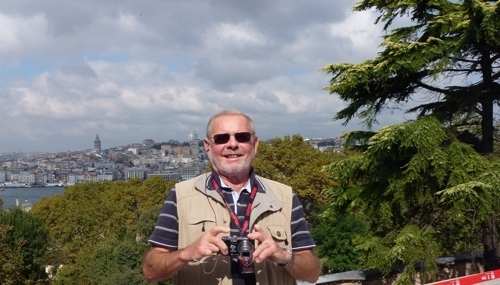 You can follow Ian's journey as he updates his blog every day, read his blog here. Ian was kind enough to take a break from walking a give us a video interview. You can watch Ian talk about the walk and his experience with The McMinn Centre and the BHR here. Hip Resurfacings Lead To Success On The Slopes for Colin! Please view the full story here. Mr McMinn comments on the recent DePuy court case outcome in the US. Having voiced his concerns about the poorly designed implant since 2005, in this article he reaffirms his opinions. Please click here to read to the full ASR story. Mr McMinn made an appearance on ITV Central News tonight after local news presenter Bob Warman had his very own BHR. Please click here to view the Central News report. We have been aware of the formation of pseudotumours in patients fitted with polyethylene containing total hip replacements for some time. Far from being a problem affecting only metal-on-metal articulations as the mainstream press insist, pseudotumours can also arise from excessive wear in total hip replacements (THRs) which use metal-on-polyethylene articulations. The stems in these THRs have modular junctions from where metal wears and releases ions and particles. Debris produced by this wear can cause high metal ion levels, leading to pseudotumour reactions in some patients. 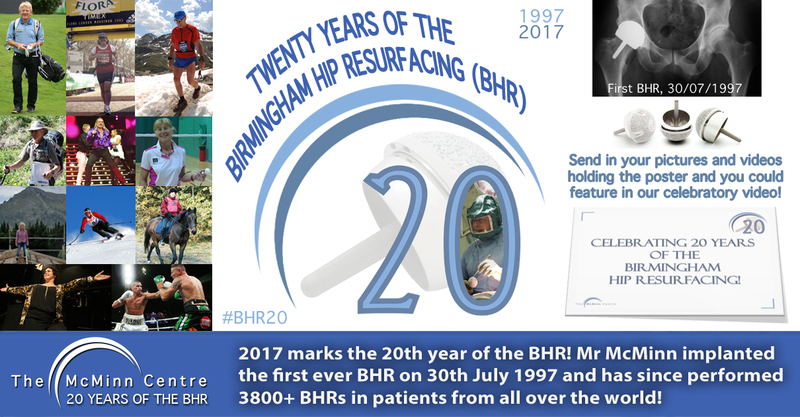 On July 30th 1997 Mr McMinn implanted the world's first Birmingham Hip Resurfacing (BHR), making today the 15 year anniversary of the BHR! Roderick Drew had bilateral BHRs with Mr McMinn back in 2002. To raise money and awareness for Macmillan Cancer Support, Roderick has decided to cycle 4,000 miles with the Olympic Torch on its 70 day journey through the UK. 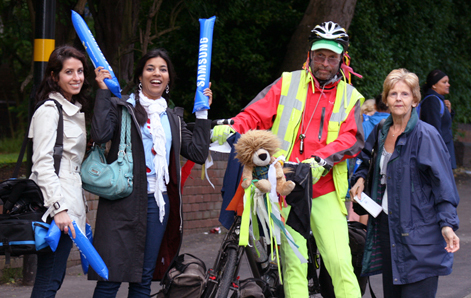 We caught up with him on day 43 as he passed through Birmingham. Read the full story and see an interview with Roderick here. There have been several press reports regarding the new MHRA (Medicines and Healthcare products Regulatory Agency) guidelines on metal-on-metal (MoM) hip replacements. We have had a number of enquiries from concerned patients. We have also been receiving calls and emails from patients who have enjoyed excellent quality of life following their BHRs - in some cases, performed over 10 years ago. These patients are understandably very angry that BBC Newsnight, amongst others, has produced such a biased, one-sided story leaving hundreds of people unnecessarily "terrified of poisoning, cancer, yearly blood tests and possible surgery to remove the metal hip," as one of our patients puts it. The Newsnight report from 28.02.12 and the updated MHRA Alert relate specifically to large diameter MoM total hip replacements (THRs). These types of THRs sometimes suffer failure at the “taper junction” - between the femoral head (ball) and the stem of the implant. As a result of taper failure, metal ions are released causing adverse reactions in certain patients. Most modern THRs including those manufactured from metal, ceramic and polyethylene, have taper junctions. Metal release is not specific to MoM THRs, however and has been reported from taper junctions in all types of THRs including ceramic and polyethylene types also. The BHR does NOT have any taper junction and is therefore completely free of metal release from taper problems. If you have had a BHR, you are at no risk of taper wear and metal release from taper junctions. The BHR is a MoM joint, but the metal release from well-implanted BHRs is very low. The McMinn Centre continues to follow-up cohorts of patients in several ongoing longitudinal metal ion studies and we find no cause for concern either locally, in the region of the joint, or systemically. The MHRA does not recommend routine metal ion testing or imaging for asymptomatic patients with BHRs. Mr McMinn does not use MoM THRs unless absolutely necessary. Some patients are however, most suitable for a metal-on-metal THR due to their specific clinical circumstances. In such patients, Mr McMinn sometimes finds it necessary to use a BHR-type cup and modular head on a Smith and Nephew titanium total hip stem. He has not seen any taper junction problems in his series of MoM hip replacements. Analysis of the NJR’s (National Joint Register of England and Wales) data shows that the BHR type modular THRs performed with Smith and Nephew titanium stems have good results. In Mr McMinn's own series of MoM THRs, the success rate is 99% at 5 years and 98% at 10 years. For further reassurance, please find below some related links you may be interested to read. If patients have any further concerns and would like to speak to a member of our team about this matter, please call us on 0121 455 0411. On Saturday, Mr McMinn and his team attended the 10th Annual Surface Hippy Gathering in Santa Clara, California. The event, organised by hip resurfacing advocate Vicky Marlow, gives patients an opportunity to speak face-to-face with leading orthopaedic surgeons. Mr McMinn and his team presented their ongoing research work, specifically addressing the recent negative press surrounding Metal-on-Metal hip implants and debunking some of the many media myths. Mr McMinn’s presentation culminated in showcasing his new hip implant technology. The gathering was a massive success and the 80 plus attendees enjoyed the day immensely. 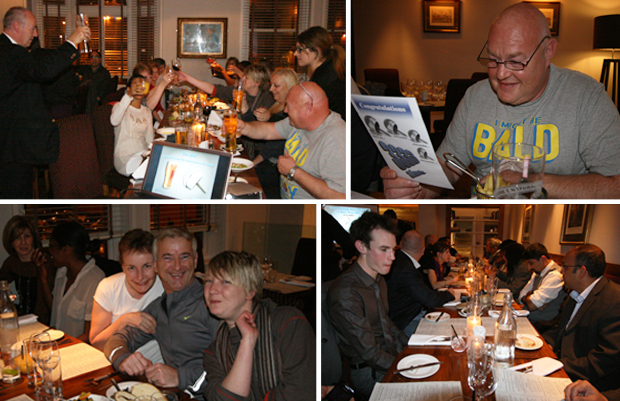 The meeting was followed by dinner and drinks at Birk’s restaurant. We would like to take this opportunity to say a huge thank you to Vicky for arranging and overseeing the day. Next on his agenda, Mr McMinn travels to San Francisco ahead of the AAOS (Academy of Orthopaedic Surgeons) Annual Meeting. We have been receiving phone calls following recent press reports on failed metal-on-metal hip implants. We understand these sensationalist stories may cause anxiety among some patients. However, we would like to reassure our patients that these reports mostly concern failures with the DePuy ASR and the DePuy ASR XL, not the Birmingham Hip Resurfacing (BHR). High failure rates with the ASR and ASR XL have been widely documented. Both devices have now been withdrawn from the market. Research indicates the side effects, such as muscle damage, are specific to the ASR and do not apply to the BHR which is a very different device. In addition to the MHRA’s guidance, we wish to emphasise that Mr McMinn’s results with the BHR show a 97% survival in men and women of all ages at 14.5 years. Furthermore, excellent results with the BHR have been documented in National Joint Registers from around the world. If you do have any concerns, please call The McMinn Centre on 0121 455 0411or email us at enquiries@mcminncentre.co.uk. On Tuesday, Mr McMinn reached a momentous milestone in his surgical career – implanting his 3,333rd Birmingham Hip Resurfacing. To mark the occasion, Mr McMinn invited colleagues from The McMinn Centre, Smith & Nephew and The BMI Edgbaston Hospital for an impromptu shindig at Bindles Brasserie in Worcester. The news comes at a crucial juncture as more and more patients are demanding highly experienced surgeons to perform their hip procedures. 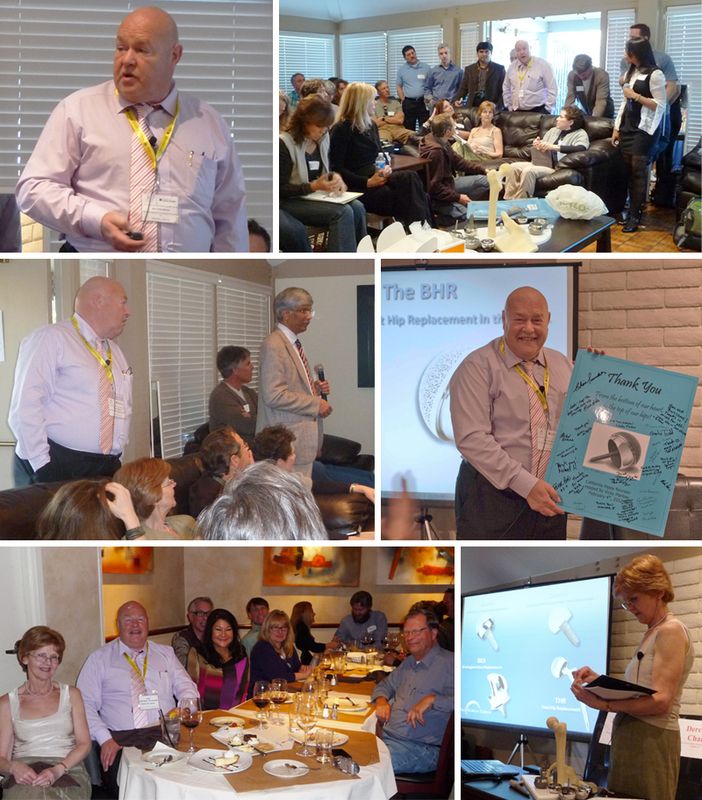 Before dinner, Mr McMinn gave a short presentation about the history and success of the BHR and the future of hip arthroplasty. The milestone precedes another exciting occasion on the 2012 calendar – the 15th Year Anniversary of the Birmingham Hip Resurfacing procedure, which we will be reporting on this summer . 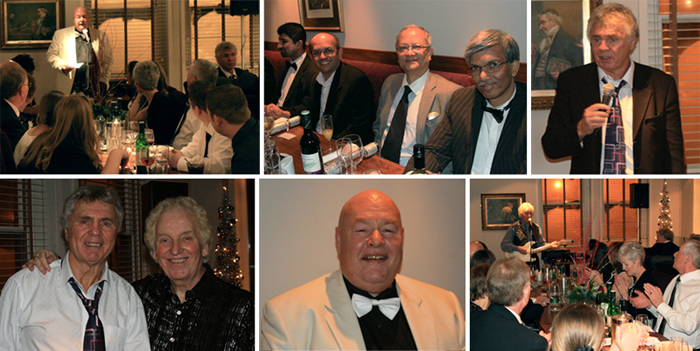 McMinn Centre Christmas Party - On Saturday, Mr McMinn and a group of nearly 70 colleagues celebrated Christmas in style at the recently launched Bindles brasserie in Worcester. After dinner entertainment was provided by Liverpudlian stand-up Stan Boardman – himself one of Mr McMinn’s hip resurfacing patients – and former member of The Fortunes, Shel MaCrae. The night was immensely enjoyable and Stan – now celebrating 10 years with his Birmingham Hip Resurfacing (BHR) – showed everyone his dancing prowess by boogie-ing to a number of Fortunes hits. View a selection of photos from the night below. X-Factor Contestant Thrilled with his Bilateral Birmingham Hip Resurfacings (BHRs) - We are delighted to report that one of Mr McMinn's patients Wagner Carrilho (of X-Factor fame) featured on the ITV Central News program tonight. Wagner, who had bilateral hip resurfacings with Mr McMinn 12 years ago, continues to thrill crowds with his performances, including his signature piece, the Hippy Hippy Shake. Read more about X=Factor's Wagners hip resurfacing experience here. Mr McMinn Celebrates 20 Years of Metal-on-Metal Hip Resurfacing - Today Mr McMinn and a group of his closest colleagues celebrated the 20th anniversary of Metal-on-Metal Hip Resurfacing. In February 1991, Mr McMinn implanted the world's first Metal-on-Metal Hip Resurfacing, eventually leading to the development of the Birmingham Hip Resurfacing (BHR). The BHR procedure has since become a global phenomenon, restoring the quality of life in thousands of patients all over the world. After a busy day in surgery, Mr McMinn was led to a surprise party to honour this auspicious occasion. Of course, Mr McMinn continues to push the boundaries in hip and knee replacement. But it was important to acknowledge two decades of his vision and technical innovation which has transformed the lives of so many patients. A selection of images from the day can be viewed below. Body Building Birmingham Hip Resurfacing (BHR) Patient features on Surface Hippy Website - Five-time WFF Body Building Champion, two-time WFF Mr Universe and action movie star Mike Mitchell talks about his recovery following a BHR surgery by Mr McMinn. Mike was kind enough to let The McMinn Centre meet up with him on the set of his latest film. You can watch Mike on set and talking about his hip resurfacing surgery here. An Evening with Derek McMinn - On Thursday 2nd September 2010, Mr McMinn welcomed an audience of GPs and Physiotherapists to a special evening of lectures at the Elmhurst School for Dance in Edgbaston. The audience was invited to hear Mr McMinn and his team talk about their vast experience in hip and knee replacement surgery, with a focus on hip resurfacing, and to discuss a range of current hot topics. We were delighted to have Dr Sam Mukherjee a respected local GP chair the event. Presentations were also given by McMinn team members Chandra Pradhan, Joseph Daniel, Imran Ahmed and Hena Ziaee. The night was a huge success and Mr McMinn rounded off proceedings by signing copies of his book 'Modern Hip Resurfacing' for delegates. A selection of images from the event can be viewed below. Mr McMinn Named as one of the UK's Leading Hip Surgeons - We are delighted to report that Mr McMinn has been named by peers as being amongst the UK's top hip joint replacement surgeons in a survey conducted by the Daily Mail. The article is available from the link. Derek McMinn Interviewed on Surface Hippy Website - Derek McMinn was recently interviewed by Vicky Marlow from the Surface Hippy website. In these video interviews, Mr McMinn discusses a range of topics on Hip Resurfacing including device designs, the importance of component positioning and the recent MHRA Alert for Metal-on-Metal bearings. Please click here to access the videos, available in 3 parts. Response to MHRA Alert - Please see the link below for The McMinn Centre's response to the recent MHRA guidelines regarding metal-on-metal hip resurfacings and hip replacements. Research Publications and Proceedings Update - Please see the link below for a list of Publications and Proceedings from The McMinn Centre. Live surgical webcast of Birmingham Hip Resurfacing - Derek McMinn will demonstrate a Birmingham Hip Resurfacing procedure from Spire Little Aston hospital during a LIVE satellite transmission to the USA on Friday 12th June 2009. The transmission will be available to view online as a live webcast, commencing at 15.15 BST (British Summertime). Click here to navigate to the media player for the webcast. 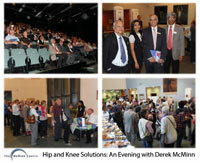 'Modern Hip Resurfacing' Book Release - The much anticipated book by Derek McMinn is due for release in February 2009. 'Modern Hip Resurfacing' is an account of Mr McMinn's experience with hip resurfacing and an effort to educate orthopaedic surgeons on the lessons that he and his colleagues have learned over the past 18 years. The book includes contributed material from an assembled team of experts in all aspects of the resurfacing procedure, from materials science to the surgical procedure itself. Accompanying the book is a DVD with over 3 hours of video material, which includes footage of surgical procedures narrated by Mr McMinn himself as well as a documentary looking into the history behind hip surgery at the Wrightington Museum. More information about the book can be found by clicking here. New Surface Hippy website - Patient advocate Vicky Marlow founded the Surface Hippy website following her hip resurfacing surgery in 2005. The site is an extension of the Surfacehippy Yahoo Groups message board. The new site can be visited by clicking here. Hip resurfacing pioneers Derek McMinn & Ronan Treacy honoured by Birmingham Mayor - News article from the Birmingham Mail, 4th June 2008. McMinn Centre videos now available on YouTube - The video material included on this website is now also available to view on YouTube, where video material is continually being added. Click here to navigate to our YouTube Channel - don't forget to subscribe for regular updates! 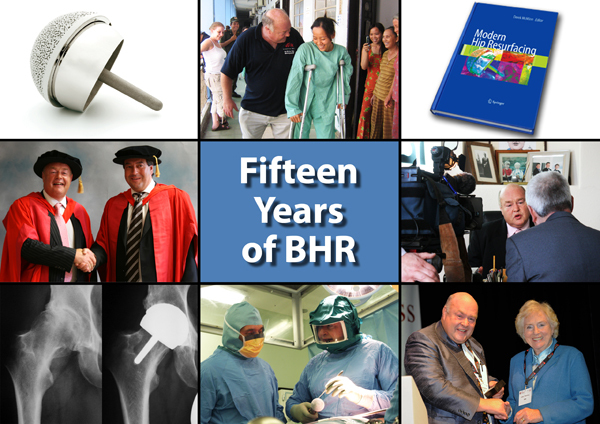 BHR 10 year anniversary - It is 10 years today since the implantation of the first Birmingham Hip Resurfacing (BHR). Since then over 70,000 have been implanted worldwide, and Derek McMinn has implanted more than 2,800 himself. 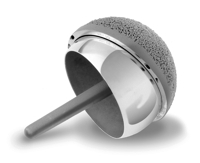 In May 2006 the FDA gave approval for the Birmingham Hip Resurfacing to be used in the USA, making it the first metal-on-metal hip resurfacing prosthesis to be granted approval. McMinn Centre patient notches up running milestone - News article on Bob Emmerson, McMinn Centre patient, who has completed nearly 4,000 miles since his Birmingham Hip Resurfacing operation. Derek McMinn responds to comments made by CEO for Corin, Ian Paling, relating to Anna Benson-Gyles' witness submission to the FDA Advisory Panel last month. This was published in the online subscription magazine, 'Orthopedics This Week'. Click here to view the PDF document of Ian Paling's initial comments followed by Mr McMinn's response. Anna Benson - Gyles gives witness statement against the Cormet 2000 resurfacing device at the FDA Advisory Panel Meeting - Anna Benson-Gyles submitted a witness statement to the FDA prior to the panel meeting concerning the Cormet 2000 resurfacing device, which took place in Washington DC on the 22nd February 2007. BBC West Midlands Radio - David Walker talks about his success at the Judo Masters Championships on BBC West Midlands radio, following his bilateral hip resurfacings. He won a bronze medal in the competition. Woman Magazine - After Lorraine Birch suffered from osteoarthritis, she took advice from a friend who suggested the Birmingham Hip Resurfacing. After having her hip joint resurfacing operation she was able to return to her job and resume her main pastime playing golf. Hospital Doctor Magazine - Last year Derek McMinn was a finalist for the Innovation category of the 2005 Hospital Doctor Awards, which celebrate clinical excellence and innovation in hospital medicine. 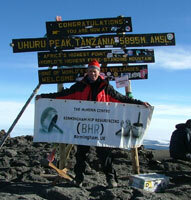 Patient with Bilateral Birmingham Hip Resurfacings climbs Kilimanjaro - William Scott-Aiton, along with 25 other individuals, trekked to the summit of Uhuru Peak, Tanzania. They covered 80km, ascending to 19,500 feet over six days. The expedition raised ï¿½57,000 for Hazel's Footprints Trust, which helps people to work voluntarily with individuals in less privileged places around the world. The Daily Mirror - An article about Karen Ricketts, who after having a BHR went on to have a family, despite being told previously that her bones wouldn't allow her to have children. The Squash Player Magazine - High impact sports, coupled with hereditary causes, meant that ex-professional squash player Jonah Barrington and all round sportsman Freddie Menzies suffered from osteoarthritis. They both went on to have bilateral Birmingham Hip Resurfacings. Cheshire Life Magazine - A running article featuring one of our previous patients George Dobson who is displaying his ability to run regularly despite his artifial hip joint replacement, the BHR. The Rambler Magazine - A group of 'hippy' ramblers try out their new hips on an expidition in CapelCurig, Wales. Harlepool Mail - Having an active sporting lifestyle meant that this patient wasn't willing to undergo a traditional hip replacement, and after seeing a report about the Birmingham Hip Resurfacing on television, he decided that it was the right choice for him. LMA Mail - An article interviewing football manager, Lawrie McMenemy about his experience of having both his hip operations. Lawrie took part in a hip resurfacing case study video available here. The Times - Jonah Barrington talks about the rigorous training schedule he underwent at the height of his squash career, and talks about why he was happy to have a Birmingham Hip Resurfacing after refusing the hip replacement options available to him. Daily Mail Good Health - Jonah Barrington talks to the Daily Mail about his hip operation experience performed by Derek McMinn. For more information, you can watch Jonah fully recovered in this interview. The Telegraph - An article from the Telegraph, which highlighted the 5 year follow up results of the resurfacing technique. The Scotsman - A newspaper article about the introduction of replacement hip surgery implant, the Birmingham Hip Resurfacing (BHR) and surgeons learning the operation. Brighton Local Paper - Desmond Turner is the Labour MP for Brighton Kemp Town. Since having his hip resurfacing operation, he has been able to return to full mobility at work. For more information, you can watch Des in a hip resurfacing video interview here. The Daily Mail - An article introducing hip surgery implant, the Birmingham Hip Resurfacing (BHR) using Don Laight as a case study. The Times on Sunday - An article initially introducing the BHR (Birmingham Hip Resurfacing) as a new innovative hip joint replacement product. Birmingham Post - A Pre-BHR press article about how Derek McMinn performed multiple hip, knee, elbow and foot operations on a lady in the West Midlands.